Live Intentionally You matter. Live like it. The news came as quite a surprise. 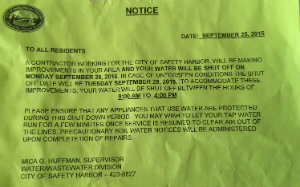 We knew the city would be shutting off the water Monday from 9 AM to 5 PM to do some work on the pipes on our block. But we did not expect the what followed that evening… a “precautionary boil warning notice” given to everyone on our block, telling us all we should boil all water for the next 2 or 3 days. Maybe God is preparing you for Haiti. As I prepare to spend a week serving in Haiti, I realized how blessed we are to have indoor plumbing that provides clean, safe drinking water. And I have more empathy for how challenging life must be in Haiti. I’m not exactly sure how it works at House of Blessings, but my understanding is they have to get water from a stream and it can be quite a hike with big elevation changes. Journey Community Church and others have been trying to help them drill a well, but being in the mountains makes it difficult to get drilling equipment to the site and past attempts to drill have not been successful. 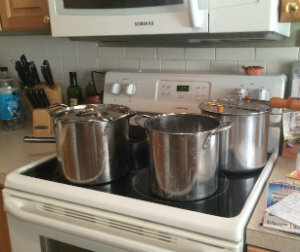 We got a 2-3 day boil notice, but many Haitians have an indefinite boil notice. You can learn more about House of Blessings Haiti and how you can join me in helping them here. I’m Going to Haiti in 11 Days! Hey, thanks for reading Live Intentionally. I'm Paul Steinbrueck - husband, father of 3, CEO of OurChurch.Com. I love to learn, I love to take on new challenges, and I love to help other people become more than they ever thought possible. More about Live Intentionally. © 2019 Live Intentionally. All Rights Reserved.